At the time of testing, the AW1’s raw files were not supported by Camera Raw or Lightroom, so Nikon’s ViewNX 2 software that comes with the camera was used to process the uncompressed files to the TIFF format. At its base sensitivity of ISO 160, the AW1 resolved 24 lines per mm – a sound readout given that some compact system cameras with APS-C-sized sensors have produced similar levels of detail in the past. The same 24lpmm were resolved up to ISO 400, but beyond this setting the figure gradually began to trail off to 18lpmm at the camera’s maximum ISO of 6400. Clean, noise-free images are produced from ISO 160-400, although signs of luminance and colour noise are evident at ISO 800. These gradually worsened to such a degree that I would consider ISO 1600 to be the top limit you would regularly want to push to. Added to this, the saturation at ISO 3200 and ISO 6400 is noticeably more muted than at the lower settings, and while the in-camera noise reduction that is applied to the four-digit ISOs reduces colour noise effectively, it comes at the expense of a more waxy overall appearance. 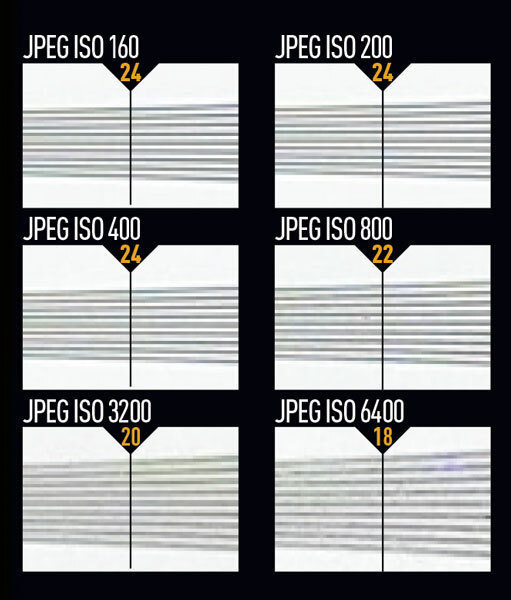 These images show 72ppi (100% on a computer screen) sections of images of a resolution chart, captured using the 11-27.5mm f/3.5-5.6 kit lens, set to 50mm (equivalent). We show the section of the resolution chart where the camera starts to fail to reproduce the lines separately. The higher the number visible in these images, the better the camera’s detail resolution at the specified sensitivity setting.